Sony is beefing up their VAIO line with three new notebooks, the F-, Y- and W-Series, and is refreshing their VAIO Z-Series. The four new models are available with Blu-ray drives as well as Sony's Transfer Jet technology. The Sony VAIO Z-Series, with a 13.1" LED backlit screen, weighs only three pounds, thanks to a lightweight carbon fiber body. This road warrior can still kick back and entertain, with a Blu-ray optical drive and HDMI out for movie time. The Z-Series will use solid state drives of up to 512 GB and come with optional 3G connectivity from Verizon. Pre-orders are available now with configurations starting at $1000. The F-Series is a multi-media affair, with a 16.4" 16:9 screen, and an optional Blu-ray drive to take advantage of that wide aspect ratio. Of course, it pumps out video in full 1080p and boasts an Intel Core i7 processor. It will be available sometime in the spring for around $1900. 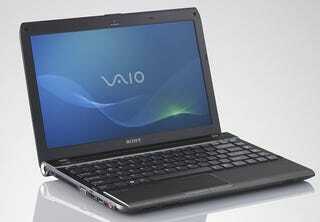 The VAIO Y-Series is a 13.3" LED, 3.9lb notebook based on affordability and portability. It's stuck with a Intel Core 2 Duo, but at only $800 makes for a good value. Pre-sales start today. At just over three pounds, the Z notebook is housed in a durable carbon-fiber aluminum chassis and delivers all the features found in a full-sized PC including the latest powerful Intel® processor technology. A dynamic hybrid graphics system lets you easily set your graphics performance to provide power when you need it and energy savings to extend battery life when you do not. Select "speed" for maximum power when multi-tasking, "stamina" to conserve energy or "auto" to have the unit select the appropriate computing usage for you. The PC integrates wireless 3G Mobile Broadband technology provided by Verizon Wireless Mobile Broadband Built-In (optional), Wi-Fi® (802.11n), and Bluetooth® wireless technologies-so you will always be connected. For 3G Mobile Broadband technology, a separate Verizon service subscription is required (fees apply). The Z Series comes exclusively in solid state drive (SSD) models-up to 512GB. Faster and more durable, the SSD unit provides a rapid boot-up and quicker access to applications than is typical of standard hard drives. Featuring a 16.4-inch (diagonal) screen, the VAIO F Series is the ultimate multi-media, entertainment notebook. It incorporates an optional Blu-ray Disc™ optical drive so it can play high-definition content like movies in Full 1080 HD resolution as well as record, store and playback personal content on high-capacity BD media (select models). Its display is ideal for watching Blu-ray Disc movies. Since many HD films are shot with a 16:9 aspect ratio, the unit's extra-wide LCD is constructed with the same dimensions. This minimizes the black bars that typically appear, letting you view movies in their intended format. For those who prefer to watch content on a big screen television, it also has an HDMI™ output connector so you can connect to a high-definition TV set for a larger viewing experience. An NVIDIA® GeForce® dedicated graphics card provides high-definition graphics processing for intense gaming action without placing huge demands on the unit's CPU. Launch directly into Sony's own Media Gallery software by pushing the designated VAIO button on the keyboard and create high-quality home movies. Import your photos and video, choose a theme and soundtrack, click finish and the software does the rest, generating a professional-looking movie complete with special effects. The PC incorporates Sony's own Transfer Jet™ technology (select models) enabling you to wirelessly transfer digital photos from select digital cameras-quickly and easily. Simply place your camera on the palm rest and your digital images transfer automatically. A Transfer Jet enabled digital camera and Memory Stick® are required. Both notebooks come equipped with an assist button that links directly to VAIO Care™ software to help maintain and troubleshoot any issues. They also incorporate backlit keyboards for typing in dark situations. The Z Series comes with Windows® 7 Professional operating system. The F Series is loaded with Windows Home Premium 64-Bit operating system. The VAIO Z Series will retail for about $1,900 and be available in late spring. For more information on the Z Series log on to www.sony.com/pr/zseries. The F Series will start at around $1,000 and is available online today for pre-orders at www.sony.com/pr/fseries. They will also be sold at Sony Style® stores and at other major retailers around the country. WHO: Great for students and anyone who is constantly on the move, the VAIO Y® Series notebook offers premium portability and serious power at an affordable price. A breeze to carry at just 3.9 lbs, this PC features a durable magnesium casing and delivers up to seven hours of battery life for true mobile freedom. WHAT: With a thin 1.2-inch profile, the Y Series notebook delivers both portability and performance. An optional Intel® Core™ 2 Duo ultra-low voltage processor and up to 8GBs of RAM help ensure that this PC delivers the power to meet your computing demands, whether running multiple programs or streaming movies over a wireless connection. Whether a TV show or sharing photos and home videos, the Y Series notebook lets you view content on your compatible big-screen at an incredibly high level of resolution. An HDMI™ output delivers both your video and audio to compatible televisions and displays via a single cable (sold separately), providing the optimal digital connection. It is also equipped with Stereo Bluetooth® technology for streaming CD-quality music and audio from your notebook to other compatible devices, such as wireless Bluetooth headphones or speakers. A precisely engineered keyboard creates a more intuitive typing experience on the Y Series while helping to reduce mistakes and a built-in camera and microphone provides easy video messaging with friends and family. WHERE: The VAIO Y Series starts at $800 and is available starting today for pre-sales, at Sony Style stores around the country. To find the closest Sony Style store, please visit: www.sony.com/pr/yseries.